I love hockey. I love the sport, I love the game, I love to play and watch. I'm from Pittsburgh and I love sports. As a result I love the Pittsburgh Penguins and, by extension, the National Hockey League. The past week made me pause on that love. Sports are an escape but given that they rely on humans for the entertainment sometimes life gets in the way. Unfortunately it's also what breaks that escape really lets you down. This past week in the NHL is a prime example. Semyon Varlomov. What he's accused of is disgusting and despicable. I won't go into the details or ramble on far too much about it. Anything I could say was said much, much more eloquently by Liz. However it's horrible and the Colorado Avalanche rewarding his actions by letting him play and starting him are disappointing to say the least. A man accused of beating a woman and kidnapping her should not be allowed to immediately be rewarded within his profession. Time off was the only acceptable course of action and the Avalanche put winning above all else. Perhaps it's fitting with new coach Patrick Roy's history that Varlomov played. 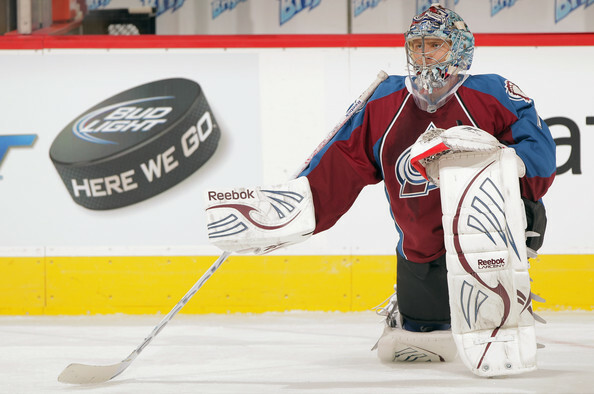 It's easy to argue "due process" but Varlamov has a history and it's being ignored. here's my fist. No fine, no suspension, just a sigh and a shaken head by the higher ups. Pathetic. I've been fortunate enough to cover the league professionally. I know every one of these players are flawed idols. I know it's a fool's game to count on them to be the best and for those who run the league to act in accordance with your views and logic. However this week was just another blow to the already black eyes of the NHL and their decision makers. I'm not leaving, I'm not quitting, I'm staying around. However it's events like the past week and the inaction of those who should set examples that make me realize that my love of the sport can be boiled down to weekends at the rink and grabbing a beer later, not worshiping a sweater. As Dejan Kovacevic said Gary Bettman needed to step in. Instead he shrugged his shoulders, said he didn't like it and did nothing. It was beyond disappointing. This feeling will fade. The love will return. Right now, however, it's damaged. And it's a reminder of when this just isn't fun.